Accommodation vessel DP GEZINA owned by Chevalier Floatels has recently completed its commitment with Saipem to support the installation work related to topside hook up and modification at Burullus Simian Control Platform, located some 65 km offshore Egypt, in approximate 60 m water depth. DP GEZINA was elected for this project since it could deliver the comfortable accommodation for the 40 technicians as well as the operational flexibility required for this demanding project. Full catering and laundry services as well as medical and hospital facilities are available on board. DP GEZINA is able to remain offshore for 30 days with sufficient provisions and consumables. The vessel is requested to be in stationary position close to the platform, at suitable distance, in order to allow personnel transfer, by means of its fixed Ampelmann walk to work gangway, from vessel to the platform boat landing for 24hrs per day, 7 days per week. DP GEZINA was mobilized from Rotterdam to Limassol, Cyprus where on hire survey and final preparations were completed. As from late April 2014, the vessel started its activities at location. Early August the contract is expected to be completed successfully. The West Delta Deep Marine (“WDDM”) Concession is located approximately ninety (90) km offshore Egypt, on the north-western margin of the Nile Delta. Significant gas reserves have been discovered in various reservoirs including Scarab, Saffron, Simian, Sienna, Sapphire, Sequoia, Saurus, Serpent, Mina, Silva, Sienna Up and Solar. These reservoirs are progressively being developed in line with the development plan to maintain current and future gas supplies to Egyptian domestic market and the Egyptian Liquefied Natural Gas plant. Phase IXa comprises eight base case subsea wells and one Optional Well to be developed during 2012/2014. Each well will be developed whilst maintaining operation of the existing infrastructure. The Project wells will be tied into the three existing areas; namely Sapphire, Scarab / Saffron and Simian / Sienna. Chevalier Floatels is a young company with 10 years of experience in the floatels industry. Our expertise is in developing new concepts for floating accommodation, from five star floating hotels, worker accommodation barges up to floating prisons for governments. Our floatels are designed for installation and maintenance projects in the offshore wind, oil and gas industry. Work is done on or near expensive installations. Keeping these safe and undamaged is critical. Chevalier Floatels has developed a new concept for the offshore wind and offshore oil and gas industry that is much more than just accommodation. This concept sets a new standard in terms of reliability, efficiency and comfort. 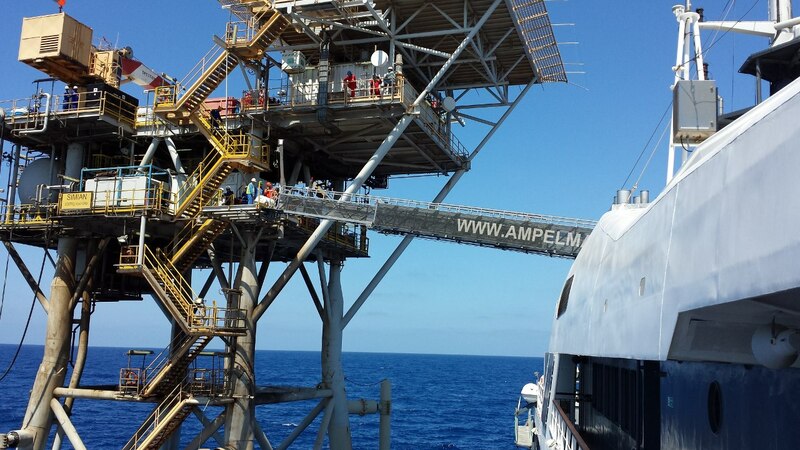 Offshore vessels DP GEZINA and DP GALYNA both have a fixed Ampelmann heave compensated gangway with a reliable DP2 system to transfer the technicians to the platforms, making sure technicians, platforms and vessel remain safe under all circumstances. Both vessels are extremely fuel efficient. Chevalier Floatels also owns and operates accommodation barges KALMAR, SANS VITESSE and NORTHERN COMFORT with respectively 220, 101 and 150 comfortable (single) cabins with en suite wet cell as well as recreational and office facilities.